In May of 2017, WestStar Computer Consulting, Inc. proudly announced our acceptance as a Patterson Preferred Hardware Provider! Keeping your best interests in mind, Patterson Dental created a Preferred Hardware Provider Program to ensure their clients will receive high quality installations and ongoing support with trustworthy, reputable hardware and networking providers. As one of the 16 original Certified Hardware Providers of 2000, the staff at WestStar Computer Consulting, Inc. is excited to continue our valued relationship with Patterson Dental. In January of 2005, WestStar Computer Consulting, Inc. was selected by Kodak Dental Systems to attend the National Solution Provider program as the authorized provider for Western New York. This certification encompasses Carestream's suite of software including: SoftDent, Practiceworks, Orthotrac, Orthoware, OPMS, WinOMS, and Digital Imaging Software. As the authorized network solution provider for Carestream, we also install and support all of Carestream's intraoral and extraoral camera systems, x-ray generators, digital sensors, phosphor plate solution, Panorex and Cephalometric units and their CBCT devices. In October of 2004, WestStar Computer Consulting, Inc. was selected to attend the Dentrix Certified Integration Engineer Program. WestStar successfully demonstrated our computer expertise in installing computers and networking, and further satisfied the stringent guidelines of Dentrix. Weststar has been added to the Dentrix CIE program and has multiple technicians on staff holding this illustrious title. This certification encompasses Dentrix, Dentrix Image, Dentrix Clarity, Easy Dental, Easy Image and ViperSoft. All WestStar Computer Consulting, Inc. technicians are held to industry standards and are required to carry a current A+ Certification demonstrating competency as a computer technician. Including, but not limited to, the installation and configuration of PCs and PC operating systems, laptops and related hardware. As well as, configuring networks, email, mobile operating systems and Apple iOS. 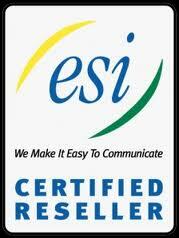 ESI knows your small business needs a telephone system that is easy to use and grows with you. That is why ESI comes complete with features you can actually use every day. Take just a few moments to learn how much our Phone Systems can do for your practice. Want to learn more? Talk to us! The Dell™ OptiPlex™ business client desktop delivers right-sized performance, security and manageability features to match your productivity needs. The OptiPlex 7010 is designed to seamlessly integrate into the office environment. Choose from four different chassis that are all optimized to maximize desk space: mini-tower, desktop, small form-factor, and ultra small form-factor. In addition, two All-in-One stand solutions enable deployment as a single device with up to 24” displays.